Instant Krazy Glue Skin Guard Formula delivers the same strong bond as the Instant Krazy Glue Original Formula, but it will not bond skin instantly. One-drop applicator is great for bonding glass, plastic, metal, rubber and ceramics. 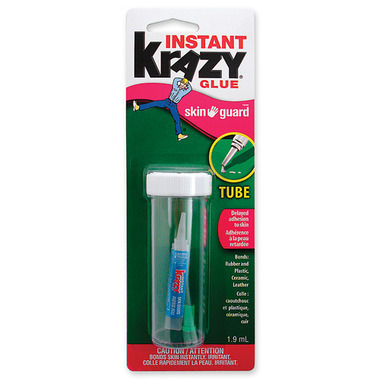 Instant Krazy Glue Skin Guard Formula's airtight, leak-proof case helps keep glue from drying out. So happy that Well.ca carries this. I kept meaning to pick it up while shopping but it always got missed. I was able to repair a pair of boots and a microwave handle with it so far:) Handy emergency fix it glue.